w.e.f. 18-02-2019 to 20-02-2019 that they shall not apply HEENA (MEHNDI) on their hands . 24-07-2018 Counselling Schedule of MPHW(Male) Under Pb.Govt. 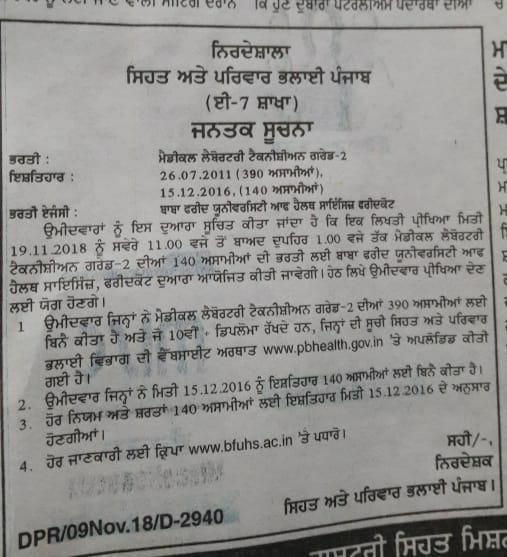 Question paper alongwith answer key shall be posted on the University website www.bfuhs.ac.in within one day after the examination for calling objections if any, from the candidates. 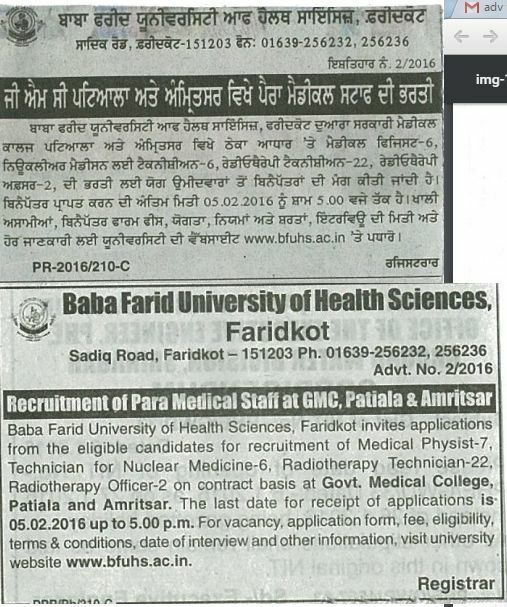 Objections to the answers, if any, can be filed by the candidates by hand on the plain paper in the university office alongwith fee of Rs 1000/- per objection in the shape of bank demand draft in favoring of Registrar, Baba Farid University of Health Sciences , Faridkot payable at Faridkot within three days after the display of the answer key. The fee of Rs 1000/- per objection shall be refundable to the candidate if his/her objection is accepted by the University. The Qualification for Block Extention Educator is Graduation and Diploma in Journalism and questions shall be on journalism as well as general health which would be prime duty of the Block Extention Educator. Download Rollno for Block Extention Educator,Opthalmic Officer recruitment test.